Than I have to go to my keychain to look up the password. Thanks to Alfred, it is easy to invoke the keychain but it means switching applications and entering the password for the keychain. I looked for the way to do this from terminal. Recently I came across rsnapshot as a backup solution that can do hourly, daily and monthly backups. I am interested in any experience but it is hard to find except for this. Linux bash shell has a nice feature called “completions”. You type a command and you press a TAB key. This will bring you a list of options that the command supports for completions. You type the first letter of any option and press TAB again. Now the list is reduced only to options starting from that letter. And so on. alias "cds=cd ~/Projects/Snowflake; cd "
How good are you at Git? 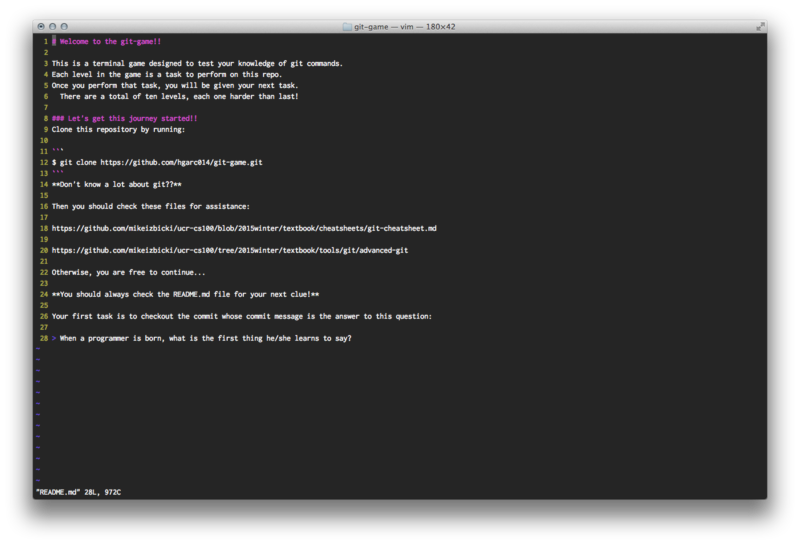 Find out using Git Game! You need to clone the repository and look at README.md for the next clue. Ten levels, getting more difficult with each level. When it comes to the code quality, there are no compromises. You either write good code or bad code. There is nothing in the middle. Many years ago I read an excellent book about code quality named “Clean Code”. That book goes to extreme and not all recipes are acceptable but I read and re-read, thought again and again until I set my own rules to writing code. I think I have a certain advantage over people, who start using PHP as their first programming language. I started with Pascal and used assembler in parallel during my first five years of programming. Neither allows compromises. Pascal is very strict and assembler is just a razor sharp to errors: one minor error and your head is off. Next I used C++, which was more relaxed but than coded in Java for a couple of years, which was also very strict programming. PHP is very relaxed when it comes to quality standards. You can assign a string to a variable and compare it to the number or to virtually anything else. You can assign any type to any variable, return anything from the function or do not return anything at all. If the programmer did not have good practice with other languages, he may start writing code, which is not that good. It is not necessarily true but it happens.